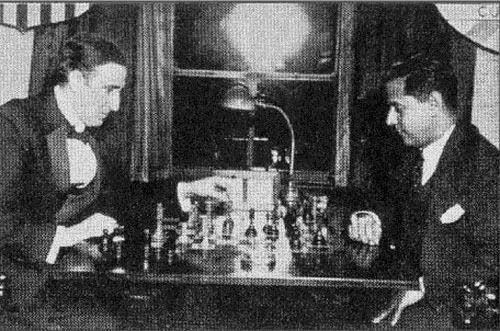 One day after Julian Assange was granted Ecuadorian citizenship, the Wikileaks founder tweeted a cryptic picture of a famous 1918 chess match in which Cuban chess master José Raúl Capablanca defeats U.S. champion Frank Marshall using a pawn. The move which Assange tweets can be seen below at approximately 7:14, in which the narrator says "And the white king is finally feeling safe." Theories naturally began to swirl in various corners of the internet, with some suggesting Assange's tweet is a message to his followers that he, "the White King" is safe. Others took the "white king" to mean President Trump - who is well protected while a pawn is used to win the match. Others pointed out that Capablanca's name translates to "White Hat" - a phrase commonly referring to an ethical computer hacker or government operative. Given the timing of Assange's Ecuadorian citizenship, at minimum the tweet suggests that some type of wheels are in motion, and Assange's stay at the Ecuadorian embassy in London - going on six years, is close to an end. The speculation was put to rest on Thursday, as the Ecuadorian Ministry of Foreign Affairs (MFA) announced that Ecuador had indeed granted naturalization to Julian Assange on December 12. The reaction of the MFA comes one day after Quito reportedly granted an ID card to Assange.